With plenty of Christmas Eve left to go, the unsung heroes of Seattle go dashing through the snow in search of the number one thing on their wish list: Billable overtime. amazing as usual, I’m gonna hafta go back and listen to all of the Shadowrun podcasts now. David just brings that world to life and washes away my objections to the setting. I agree, the scene with Trip and Enrique was so cute! Looking forward to more misadventures from the SoS, and loved the call back to the Masacre on 34th st. I think more of Ken and Brad could be in order, plus the three sister’s. They’re all first responders right? SRTs? Perhaps if Charlie took a contract from the city for a HTR team, more money of course (though not resources) … be interesting if they were seconded to a Lone Star op too. Or if All Saint’s got an arial unit. I would love to play in a SoS Con game personally. Awesome session, love the concept and execution. Romance blossoms the soul, loves sweet nectar, ambrosia. I have a group that started out playing SR 4th edition… then transitioned to 5th edition… then gave up, as the system crunch was just too much. I (like half the Internet) have been kicking around a Fate conversion. My biggest hurdle has been coming with a nice way to handle wealth (as the driving force for shadowrunners). If the characters’ primary concern is something other than gobs of money, I might be able to get around that. I’ll have to think on it. Thanks for the idea! That was a fun game! 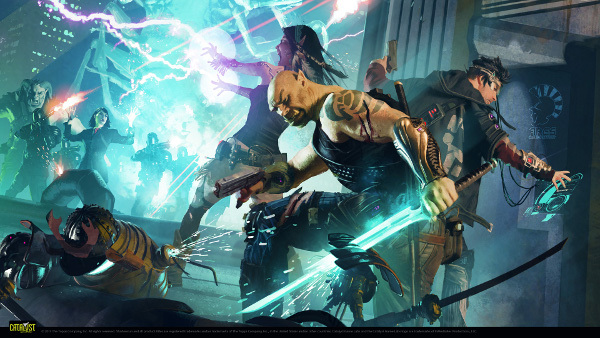 I really enjoy your take on the non-Shadowrunner aspect of the Shadowrun universe. Crazy simulation too. Just goes to show that you should never leave anything your character cares about out of sight – that’s how the GM gets ya.